Jun 13, 2006 in "Pirates of the Caribbean"
As a ghostly voice echoes through the dark, underground grottos and waterway the specter of Davy Jones appears. "Ah, but they do tell tales..." he says in reply, inviting all those "brave or fool enough to face a pirate's curse..." to continue on their voyage. Just ahead, guests will find a Spanish seaport town under siege by a heavily armed galleon. It's the Wicked Wench, commanded by Barbossa. He and his men have put the torch to the town and subjected the local magistrate to a dunking in the well. They're in search of their shipmate, Captain Jack Sparrow, and the location of the town's treasure vault. Captain Jack, temporarily abandoning the mantle of command has struck out on his own to find the treasure. He successfully eludes his fellow pirates and finally succeeds in stealing a glimpse of a treasure map in the hands of a drunken buccaneer. 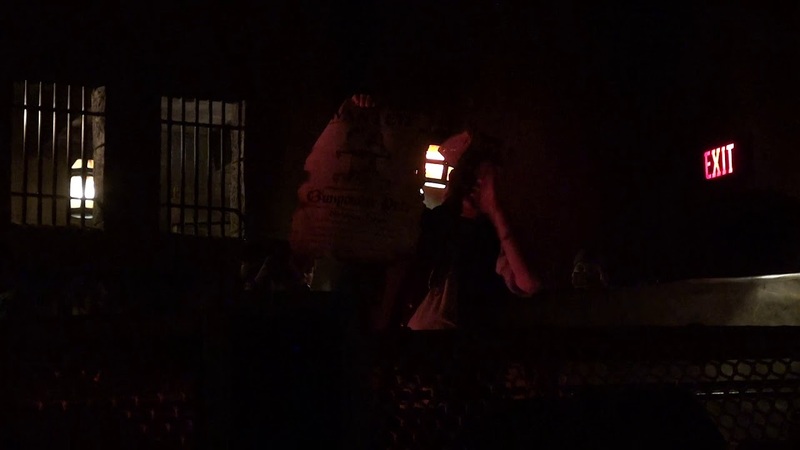 And so, after a night of revelry and looting, we find Captain Jack victorious, enthroned in a vault full of gold and jewels, enjoying a drink and verse or two of the attraction's famous theme song and intoning "Drink up, lads, there is treasure enough for all!" - The new dialog of Captain Jack Sparrow, Davy Jones and Barbossa was voiced by the actors in the Pirates of the Caribbean movies. - The original analog audio tracks from the attraction have all been digitally re-mastered to ensure a crisp and dynamic soundtrack. 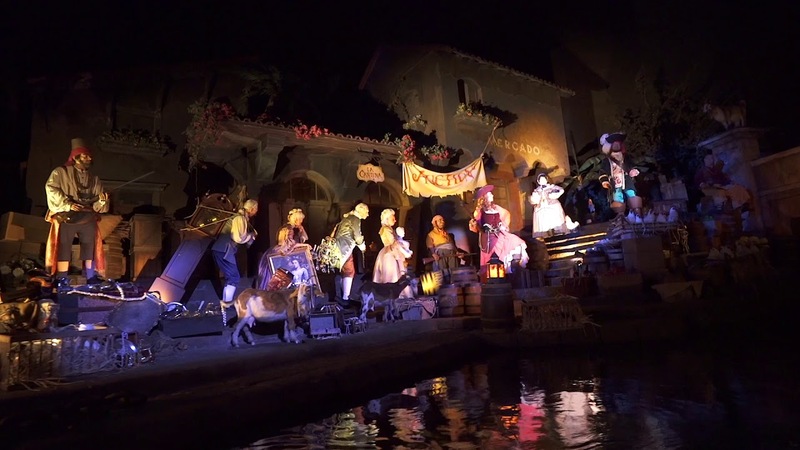 Guests will notice the addition of music cues from the soundtracks of Pirates of the Caribbean: The Curse of the Black Pearl (Score composed by Klaus Badelt) and Pirates of the Caribbean: Dead Man's Chest (Score composed by Hans Zimmer). - More than 220 audio speakers have been replaced throughout the attraction. 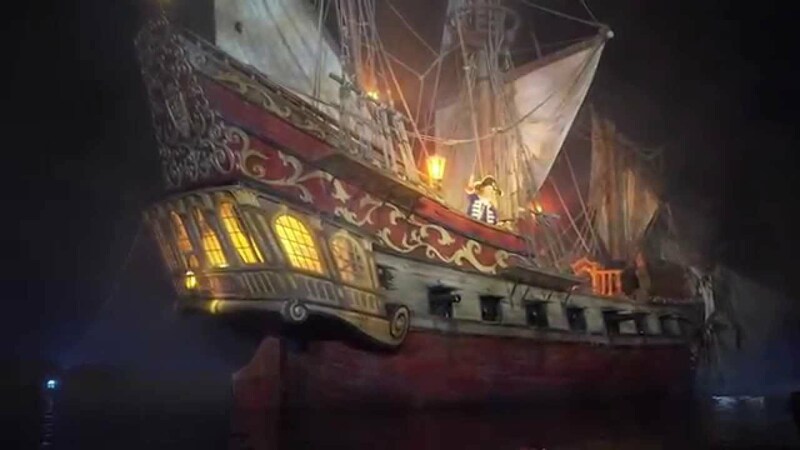 - Three bass subwoofers have been installed within the "Battle Scene" between the pirate galleon and the Spanish fortress to provide a sense of concussion during the firing of the cannons. - Both versions of the attraction (Disneyland Park in California and the Magic Kingdom Park in Florida) closed in March 2006 in preparation for the installation of the enhancements that have been made over the past three months. - Over 400 Disney Imagineers have been working in California and Florida on the research, planning and installation of these enhancements over the past three years. - The cannon firing and cannon ball effects in the water have all been upgraded to heighten the sense of intensity and drama in the "Battle Scene." Underscoring from the films has also been added to the scene. - When Disney began preparing the treasure for the enhancement, they discovered a number of original props with hand-written notes taped to the back by Imagineers from the 1960s about placement and color of the props.